With 35 years of existence, the Global Management Challenge is present in over 30 countries and has involved half a million people. In August 1979, Expresso weekly reported the launch of Gestão 80, The Great Business Game. After 35 years, this Portuguese competition now takes place in more than 30 countries and has involved half a million people. In the late 70s, when Luis Alves Costa, president of SDG, and Francisco Pinto Balsemão, chairman of Grupo Impresa, decided to create Global Management Challenge, they couldn’t have imagined what this competition would later become. The first Portuguese edition began with 120 teams, and today more than 400 teams take part. Internationalization began with Brazil in 1981, and currently covers more than 30 countries, including China and the United Arab Emirates. All this is proof that a Portuguese initiative can overcome obstacles and lead the world. The first contact Luís Alves Costa had with management simulators was when he was assistant professor of Computer Science and Management at ISCEF (now ISEG) and Time-Sharing manager. He used simulators with his students and found when they competed against a machine they learned management concepts more easily. The project was launched on the basis of a partnership that continues to this day. 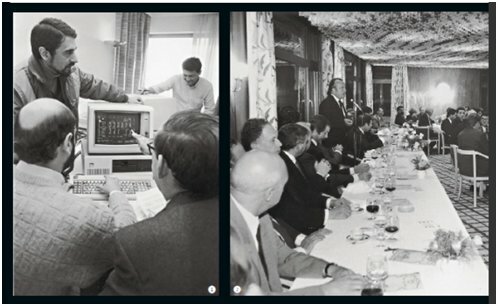 The first edition of the competition was held in 1980, with 120 teams, today in Portugal the competition is made up of more than 400 teams of students and professionals, or a mixture of both. The competition was, just like today, in three phases. In the first round, teams are divided into groups of eight teams each and have to take five management decisions in areas ranging from finance to human resources, over a five-week time period. The winners were those at the top of their respective groups at the time of the last decision, that is, the team with the highest share price for their company with respect to the competition. In the second round, players are organized into eight groups and the process is repeated. The top eight go to the national final, where they compete with each other, and the one obtaining the best result wins. Since internationalization began, an international final has also been held with the winners of each country, and where only one team can be champion. “In the first edition, we were fortunate in receiving an enthusiastic welcome from the business community, and the first participants were in fact members of boards of directors. Then came a domino effect, the directors liked it, learned the ropes and passed the message down the corporate ladder, and the rest is history”, says Luis Alves Costa. A jury, which was then chaired by Alfredo Nobre da Costa was also created. Since 1995 and still today, the jury is led by Vítor Constâncio, Vice-President of the European Central Bank. “The jury’s role is to regulate the competition, and act in a definitive, independent and irrevocable manner on all matters, questions or disputes relating to continuation, ratings or awards”, said Mr. Constâncio. In 1981, following the success in Portugal of Global Management (since 2006 known as the Global Management Challenge), the founders decided to internationalize. The best country for this first step was Brazil. After this came selected European countries, but the big step was entry into China in 1995. This was a true milestone for the Challenge, which was fast becoming increasingly valued internationally. “In China, the competition differed in some respects, since our model gives some flexibility. Before kicking off, it had to receive an approval from an association of entrepreneurs, who put the simulator to the test”. Our Chinese partner, David Shi, told us from the very beginning we had to invest in the universities and MBA students, and he was right. “In this country there are almost two thousand participating teams, made up exclusively of students. The business model is slightly different (see Business Model box) since here students pay to attend training and the cost increases as they advance within the competition. It was a way of making the Global Management Challenge profitable in China. In 2000 came the boom in Eastern European countries, which began in Poland and spread to the Czech Republic, Estonia, Latvia, Romania, Slovakia and the Ukraine. In Russia, the challenge reached an unimaginable dimension 35 years ago, with about three thousand teams competing against each other. Recent growth has focused more on Africa and the Middle East, with the United Arab Emirates and Kenya joining the challenge. “I feel that these areas will be important in our expansion,” says Luís Alves Costa. Over the years this has never been a static competition, but one that has always relied on innovation. Today’s simulator has come a long way from the original one (see Developments in Simulator box). Ray Taylor, partner at Edit 515, says that the current version, analysed by his company and the Portuguese organization in 2013, is the sixth edition, not to mention the many small changes that have been introduced over these 35 years. “It is multifunctional and creates a real challenge that we always keep up to date,” he added. The latest version, even more realistic, made changes to the evaluation criteria, which no longer measures the share price but rather, since 2013, the performance of the investment. Speaking to Expresso, Francisco Pinto Balsemão revealed that both he and Luís Alves Costa always wanted this to be a top competition and in their opinion the participants consider it very important to have taken part in the Global Management Challenge. José Galamba de Oliveira, president of Accenture Portugal, is an example. He joined the challenge in the late 80s and said, “it was an opportunity to deepen knowledge on management, because my background is engineering.” The company he runs sponsors a competition that he believes to be “an initiative that gives students and executives an excellent opportunity for learning and sharing experience on a management level”. Most companies who support the participation of teams believe the experience is formative for both students and professionals, and that it is an opportunity to evaluate and recruit college talent as well as a change to build bridges between academia and business. Also Francisco Almada Lobo, CEO of Critical Manufacturing, values his own participation in the challenge. Ex executive at Qimonda, he participated from 2008 to 2010 and recalls that the results he obtained gave confidence to him and his colleagues that they were able to run a business. In fact when his company Critical Manufacturing was established in 2009, he and his colleagues were participating in the Global Management Challenge. “It’s a very interesting competition for the various learning levels it offers, simulating what really exists in the business world,” he emphasized. In late November, the Global Management Challenge in Portugal held its 35th edition. At the heart of the Global Management Challenge since the 70s, the simulator has evolved tremendously. Over the years changes related to technological developments have been introduced and themes have been updated to follow market trends. Each new version is developed by Edit 515 and the Portuguese organization. According to SDG, the first calculations were made on the biggest computer for scientific calculation, which was called DEC10, using a batch processing system. In the first editions, the results, expressed in a management report, were processed and made available to the teams seven days afterwards. Later, the results were processed in a microcomputer but the biggest evolution came with the Internet. In terms of the issues addressed, the organization has always tried to innovate and anticipate trends. Before the introduction of the euro, the simulator began using the ECU. When environmental conservation became a worldwide concern, an algorithm was introduced to penalize the most polluting enterprises. In 2003, and because of SARS, the international final in Macau had to be postponed, which led the organization to introduce an algorithm to produce random events, such as a riot or a general strike in a country exporting raw materials. In 2013 the latest version of the simulator was released with the addition of new decisions. Variables were introduced, such as a greater awareness of environmental conservation, the possibility of outsourcing production, of expanding the plant, of giving training to retain talent and of the issuing and repurchasing of shares. What distinguishes this competition from all the others that exist around the world is the business model. The formula has survived over 35 years in Portugal and has been successfully applied in the more than 30 countries where the Global Management Challenge takes place. The organization of the competition at national and international level is shared by SDG and Expresso, who is also the media partner. The competition is based on a strong, innovative and realistic simulator, and is sponsored by companies that have a number of teams representing them. Some entities are associated in their capacity of “supporter”. This has enabled public bodies to be linked to the challenge, and given them the right to be represented by teams too. Students, professionals and a mixture of the two dispute the title. The students don’t have to pay since this cost is borne by the companies that are supporting them. The companies they work for pay for the professional and mixed teams. To get an idea of the number of entities involved in this process, this year’s edition is sponsored by 10 organizations and is supported by seven entities. More than 70 companies financed the enrolment of teams. Another pillar of the model is the national and the international juries, who not only give credibility to the competition but also ensure that in the event of a problem, there is an independent entity capable of resolving the issue. This model is replicated abroad. Countries can acquire the franchise, as long as they commit to holding a public competition, a national final, and to participate with their national winner in the international final.